One of those dead days between Christmas and the New Year. Hey, let's get some air and tick off a few more walls. Which we duly did, eventually, having struggled to find somewhere to eat. Thank goodness for the Garden Tea Rooms in downtown Beccles. Full of hot food, we hopped back in the motor (not knowing quite where we were going), consulted the map and set the SatNav to Hungate Lane. 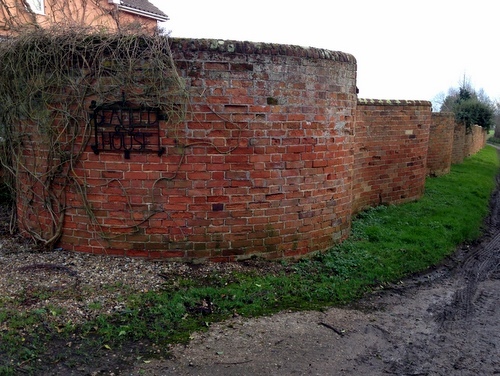 Round the corner, near Puddingmoor, sits this super gnarly ribbon complete with mirror. It even extends, after a break, to that white house at the end. Top quality, as they say. Here's a weird thing. Sitting at the next table to us in that same Beccles cafe, the only one we could find open at that time, were some friends of my mum who live up in these parts. She had a nice chat with them, caught up a bit, and was trying to remember their address: Coney Hill, as it happens. 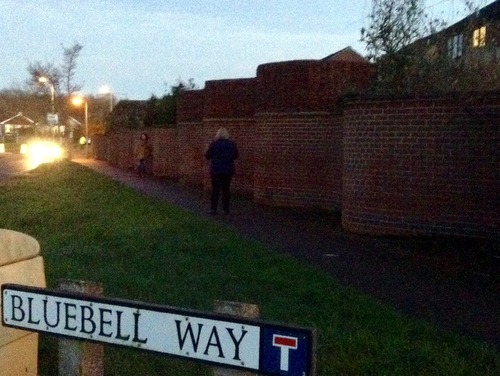 Naturally, Coney Hill, a mile or so away but still in Beccles, was our next stop-off point. 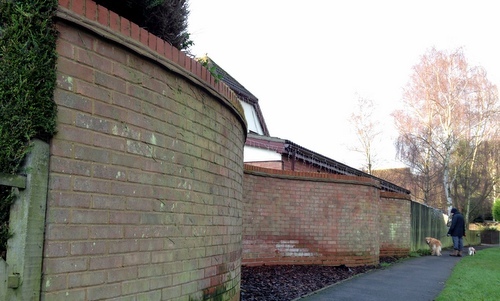 For there, facing an ordinary looking estate, sits a modern crinkle-crankle complete with wicker fence topping. Big ol' curves on this one. Can we squeeze in one more in The Darkness? Naturally, we can, if we can only find some 3G signal to quickly scan the GoogleMap. Five minutes and a mile and a half away and we're staring out into deepest Worlingham. We haven't the foggiest. Fear not, friends. One meander of about 100 yards brings us to the junction of Garden Lane with Paddocks Green where, behind that bus stop, stands a monster example. It's tall, has a door, and really has no right to be here. 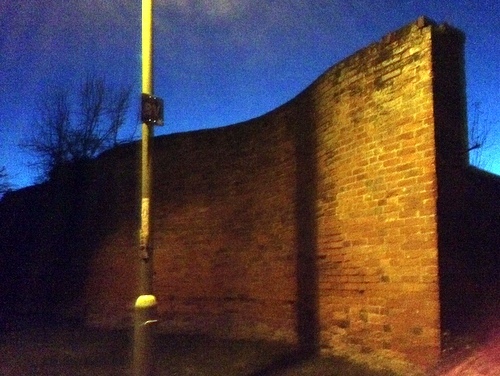 Wall of a long-gone estate, perhaps? Whatever, it's a cracker and deserves to be seen in the daylight. 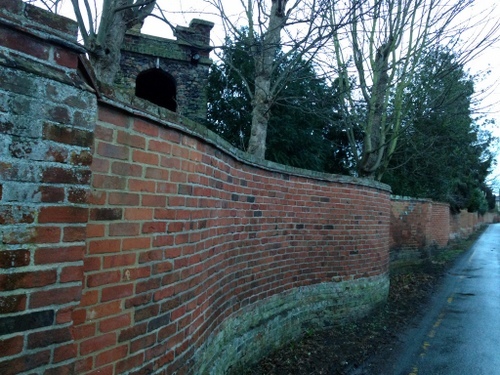 First chance to get out and about in the capitalized New Year and we're beating a path to Boxford where, according to Edward Martin's list (see above), there's a CC awaiting us on Church St. Big old church in the middle of the village but no obvious wall to be seen. Best we ask at The Stores. Helpful chap is on the case. That'll be a few doors up the road, he says, behind the orange house, but it's not visible from the road. Only way I've seen it, he confides, is from the church tower. Which is only open in the summer. Oh. What to do? Well, the local doctor's is in an odd little building set back from the main road. Wandering around there, we looked over two or three gardens and caught a glimpse. Ooh, there it is! I confess that we walked into an open green area and up to the wall, whistling and keeping an eye out for stray dogs. Delightfully sinuous curves on this one and it bends around the corner too. Snaps snapped, we hopped it before The Peelers turned up. Result. One down, 3:30pm on Saturday, and time for another. A brief tootle along the A134 and here's Sudbury, jam-packed with history. Again, if EM's list is credible, there's a contender on Friars Street. Me and Ma walk out of the town centre gazing hither and thither. Nowt. I consult one family group who won't catch my eye then see a chap on the far side of the road. Yes, he says, I know what you mean -- that's always a start -- but it's not here, it's where I work. And we've got a folly in the garden. You what? He leads us through local lanes and bang, there's the Red House, these days a retirement home where our new best friend helps out. Here's the wall, he says. Wow. Of course, he's right. 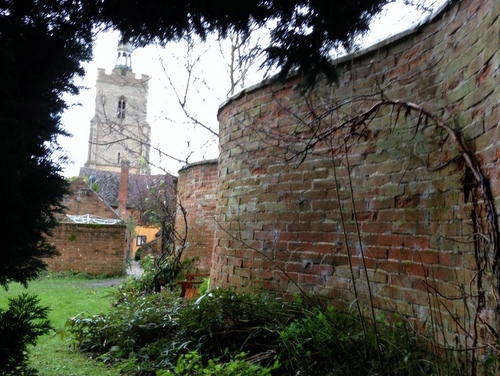 In the grounds stands a "square and battlemented gazebo", guarded by a wiggly wall up Meadow Lane and around into Red House Lane. Hats off to this anonymous Sudbury citizen. Later Googling reveals that these "serpentine walls of the garden of the Red House" are separately listed as grade II by English Heritage. I can recommend celebratory coffee and cake at David's in town. Here's an oddball which only emerged after many internet searches. 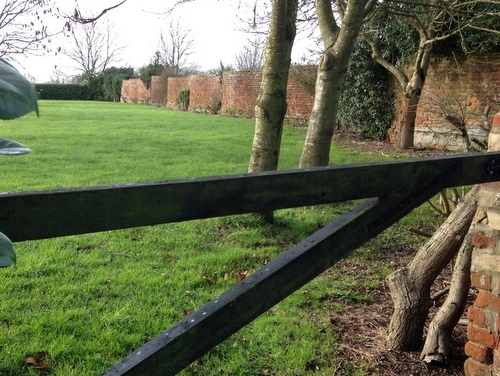 Tip of the hat to Keith Evans for posting his photo taken at Brantham on the Geograph website back in 2013. His pinpoint placement directed me to the single-track Newmill Lane, down which the Google StreetView car did not venture. That road leads to a single property named Seafield House. We're not talking fancypants rectory or grand hall but a reasonably humble dwelling, and yet there's a remarkable crinkle-crankle for a pretty decent length alongside the path which leads to the river. Unlisted from what I can tell and quite the oddity. While south of the Orwell Bridge, may as well attempt to sneak in a second on this dank Sunday afternoon. Credit to Eldest for somehow locating this particular one which has evaded all my searches. Eastward ho to the peninsula through Chelmondiston and finally into Shotley. I parked by the shop -- closed Sunday -- and wandered along The Street. Finding nothing, I retreated to the motor, headed to Land's End, i.e. Shotley Gate down by the water, then retraced my route. Reparking by the shop -- still closed -- I went a tad further. On the verge of giving up, I found it! 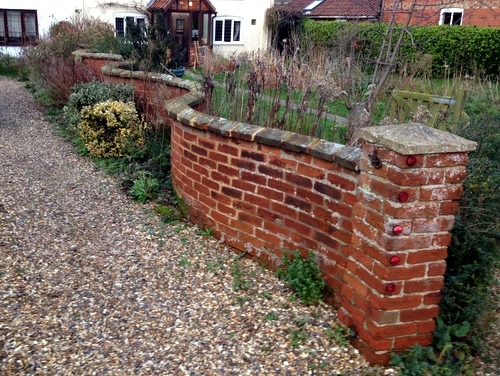 Lowest wall thus far, compact and bijou, and rather classily dividing one house's drive from the next. That was a satisfying afternoon's work. Oi, said G. on the sofa, did you know about the CC wall in Martlesham? I fumbled for the remote, found mute, and made a hand gesture inviting her to speak. Chap in the office says there's a modern one out there. Show me, I said, reaching for an iPad. Did I know about this? No I did not. And there it is, about 800m from my daily bike journey on the huge horseshoe formed by Eagle Way. Modern, of course, most likely dating from when this whole estate was built back in the '70s, I s'pose. Undulatingly good, pleasing height, and, like the best, apparently there for no good reason. Hats off to whoever was behind its conception and construction. The Crew attempted to find this fella way back in the summer but darkness had already fallen. This time, with EcoAndy en route to egg and bacon at Emmett's, we drove up the driveway (as you do) and saw some vertical bricks out front. They crinkle a bit and crankle a tad. I'm not convinced this is the one that Norm The Storm picked out. 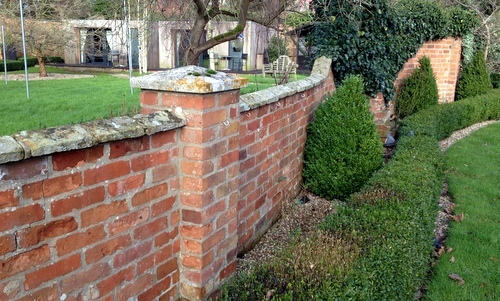 Maybe there's a walled garden round the back? I will find out and get back to you, he idly promised. New crew member in the form of birthday boy nephew unexpectedly joining me and Mater. Gave him the key job of keeping a crinkle-crankle count for the afternoon since I had Big Plans. Out through Bramford, Somersham and do-you-come-here-Offton to previously unheard of Great Waldingfield, not to be confused with that place with The Maybush pub. I'd never have known about this had it not been for online tip-offs from Brenda in Acton and Ray Connelly and Pat Bridges and Freddie Lay and Hilary Drain. Thanks, all. 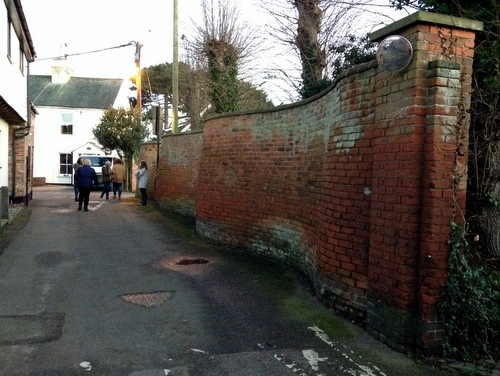 Nephew eyeballed the wall in question and we managed to park just along from Babergh Place Farm. To the left of the house and set back from the B1115 sits a mighty and majestic crinkle-crankle. Quite a stretch of it too, yet apparently unlisted. I can recommend the fine view from Google Earth.